A steganography software tool implements digital steganography process, allowing users to insert and extract hidden data into images , audio , video and documents. 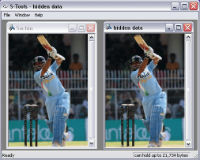 JPHIDE and JPSEEK are programs which allow you to hide a file in a jpeg visual image. There are lots of versions of similar programs available on the internet but JPHIDE and JPSEEK are rather special. BlindSide is an example of the art of Steganography - the passing of secret messages in a form such that one would not suspect the message is being passed. This is an area of cryptography that is attracting considerable interest of late. The Blindside utility can hide a file (or files) of any variety, within a Windows Bitmap image (BMP file). The program gifshuffle is used to conceal messages in GIF images by shuffling the colourmap, which leaves the image visibly unchanged. gifshuffle works with all GIF images, including those with transparency and animation, and in addition provides compression and encryption of the concealed message. files. The file in which you hide the data is not optically changed. MSU StegoVideo allows to hide any file in a video sequence. When the program was created, different popular codec’s were analyzed and an algorithm was chosen which provides small data loss after video compression. You can use MSU StegoVideo as VirtualDub filter or as standalone .exe program, independent from VirtualDub.